The first time I met Gbemisola Ikumelo, she was 25, working on the production, Life On The Stairs, a play which explored the issues of knife crime in London. Since then she has gone on to bigger and better things. In 2008, she worked with Tiata Fahodzi as an assistant director and in 2009, was part of the National Theatre’s ensemble for the production of Wole Soyinka’s, Death and The Kings Horsemen. 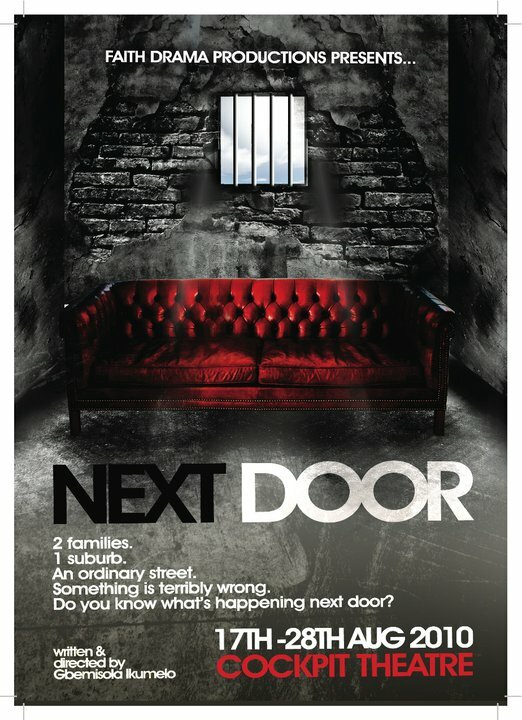 Today, Gbemi is getting ready for another production, NEXT DOOR, which she wrote and directed. In 2007, when I interviewed Gbemi, it was clear that her passion for the stage is the fuel that drives her to impact her generation. Now 28, Gbemi Ikumelo is an accomplished actress, playwright, mentor and the artistic director of Faith Drama Productions, a theatre company she set up in 2004. In her own words, Gbemisola Ikumelo and why the stage is an integral part of her life. Belinda: When did you discover acting was for you and where does the passion for the stage some from? Gbemi: The first time I really started liking drama was when we were doing a nativity play when I was 8-years-old in primary school and nobody wanted to play Mary because it would mean they have to hold Joseph’s hand. So, I said I’ll do it then and when we started preparing for it, the build up was fantastic and I started taking part in school plays and I started auditioning for youth theatres like the National Youth Theatre of Great Britain, which is very prestigious among youth theatres. I did that and you get to do shows on a professional level and that’s what really made me realise I want to do this as a career and then I went to drama school. I auditioned for drama school and I got in and I trained in Scotland. I trained as a professional actress for three years and by then, it was like this is what I definitely want to do. Belinda: Which drama school did you go to? Gbemi: I went to a drama school called Queen Margret’s in Edinburgh. Belinda: How long have you been an actress? Gbemi: Professionally, I left drama school in 2003 and it’s been four years (7 years since date of interview) now since I have been a professional actor but I have done things as a young person but it’s been four years (7 years since date of interview) since my professional career started but my acting career spans for years. Belinda: What are some of the productions you have been in to date? Gbemi: My first job out of drama school, in fact, I left drama school a little early because it was my first job. It was a company called Theatre Centre, a fantastic company that produces theatre for young people and they commission new writing. I learnt so much and I got spoilt because it was such a lovely company and thy really respected the actors, their opinion and to come from drama school where you are told that you are just a commodity, you are just a product as an actor and all that, and come into this environment was really uplifting and then I went into a radio drama company and won the Carlton Hobbs award in 2003 and that earned me a place in the BBC Radio Drama company for 6 months. It was great because I got to work on my voice because it didn’t matter what I looked like. I could play a fat woman. Then I went into Lion King for a year, which was a very different role because it was like going from small scale theatre to radio to the West End and I understudied one of the lead parts for that and that was fantastic as well. It was really tough but that was really great as well because I got to work on my singing. So, for the first few years out of drama school, I got to work on different areas of my skills and I think that really helped. Then after that, I went to Germany, where I worked with the cast of the Broadway Musical, Rent and did small scale things, large scale things and along that, developed my own writing. Belinda: How did you get the roles in the Lion King and Rent? Gbemi: The Lion King, I wrote to them when I was in drama school, the casting director, I was told she was the person to contact. I contacted her and when I left drama school, I got a call and I was working at the radio drama company for the BBC at the time. They called me and said they would like to see me for an audition and 9 auditions later, what was the longest audition process I have ever been in, I got in and Rent, it was actually my agent that called me because she knew I loved the show. She said they were doing a version of it in Germany. Do you want to go? The auditions are in an hour. I was like okay, so I ran off and did it and I was offered a part immediately. Belinda: Tell me more about the Carlton Hobbs award you won in 2003. How did that come about? Gbemi: Carlton Hobbs is a prestigious award that is given out every year. Accredited drama schools battle it out every year for a place in the company for 6 months. Belinda: Is Carlton Hobbs a company? Gbemi: No, Carlton Hobbs is the award which is in honour of Carlton Hobbs and it is run by the BBC Radio Drama company. My drama school nominated four of us and we went up against another drama school and out of those people, I think three or four people were selected to win. Belinda: That’s a great achievement in itself right out of drama school? Gbemi: I really didn’t think I would get it. I remember coming out of the last audition, thinking it was a good experience but I didn’t think I got it. So, when I got the call, saying we got it, I was completely shocked. Belinda: You have also appeared in Holby City, was it hard to switch from radio, where no one sees your face but hears your voice to TV, where you are in front of the camera and the camera gets to speak for you? Gbemi: That was tough I think and it was very exciting because it was my first television role and hopefully not my last. But it was really exciting. It was a fantastic experience because I had to completely adapt, which you have to do as an actor. As an actor, you have to be a chameleon, to be able to adapt. I played a girl called Cara, a drug/heroine addict in that particular episode. I was one of the guest stars for that episode. Belinda: Did you feel you needed to up your game after your television appearance or you felt you had arrived? Belinda: Who and what are your influences in the creative world of theatre? Gbemi: As I have grown older, I found it quite hard as a black woman to say I look up to this person. I ended up finding people like Al Pacino fantastic, Meryl Streep. It is difficult to find that one person like you to see someone like yourself. A lot of my role models are white, a lot of the people I aspire to be are white. I was the only black person on my course while in drama school. But it’s hard to find that one person that I can say is my ultimate role model. I get different things from different people and places. Belinda: Why did you set up Faith Drama? Gbemi: With Faith Drama, I set it up as a means for the young people, particularly within my church and the young black people in my area to meet and interact and to learn communication skills because so many young people have such low-self esteem. I mean people are only happy in their comfortable/own box. They don’t like to be challenged. I wanted to start challenging them and doing bizarre things, making them feel stupid like jumping up and dancing and letting themselves go and they learnt so much and they grew so much that I thought these guys are ready to do a play and we did it on a Christmas day in 2004 and these guys learnt so much and people started to say I want to go into the arts. Faith Drama became without realising it. Someone even came and said, have you ever thought of the name Faith for your organisation. Your organisation, that’s how it all happened. When I set up Faith Drama, it started off bigger than me and now I know it’s going to continue to be bigger than me. Things happened and I didn’t plan them and it just sort of, one day, we were an organisation and I don’t know how it happened. Belinda: Is it fair to say in terms of theatre and performance, that’s where you get your buzz? Gbemi: Definitely, without a doubt, I love anything theatre. I love films as well. There is something you can’t match when you are seeing something live and it’s all happening in front of you. It is fantastic. Belinda: When you started Faith Drama, what were you hoping to achieve? Gbemi: It wasn’t set up to be a drama company but as a youth club for young people to meet and when I realised that drama was a great tool to help people learn new things…people learn about the environment, social issues and sometimes we have some therapy through the drama. After seeing the effects this was having on people, I started thinking that I want this to be a company where these guys get the experience and they meet with professional artists and get to learn something new, and we get to attract young people from disadvantage background, get them in for a few hours in the week, create something and forget about all their struggles for that time. It was also about getting young and emerging artists because they were so many and that was another way, you know, getting these young people in because you will find out that some of them do have real raw talent but there is no one out there to encourage them. It was a blessing that I found out about drama school. So, people come in and say they want to be an actor but have no idea what drama school is. People are that naïve that they can train or know that drama school is different to going to university. It is about giving them nuggets, so that when they get to auditioning stage for drama school, they know what they are doing. 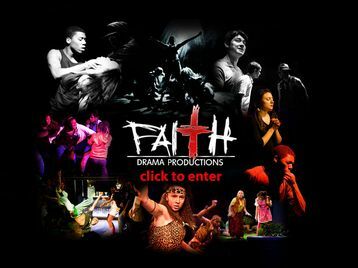 So, Faith Drama is about mentoring, providing support and also giving people the experience and opportunity to network with professionals. Belinda: Would you say, you have achieved that purpose or you are on your way there to achieving it? Gbemi: I think we are achieving it. I don’t think it is something that we have achieved because as long as Faith Drama keeps going, that is something we have to keep achieving and keep re-inventing ways to make it better. I mean last year we did a really large scale production and though I did feel we achieved so many things, I do feel that there are a lot of things we could have done differently and better. It is a constant journey. For example, we have a young lady who is going off to one of the top drama schools in the country. Though when I first met her, it was more a case where she wanted to go to university and study psychology and do drama on the side but the experience of Faith Drama for her was one of self discovery. Where she found out that she wants to be an actor and she wants to perform. So yeah, I do think we are achieving that. Belinda: With the different success stories you are getting, do you feel fulfilled as a drama tutor? Gbemi: Definitely. I mean there are so many young people coming up and I think this is why we are doing this. There have been times we have struggled trying to get money and get this in place and there are times when I have felt goodness, why am I breaking my back and some of them have come back and said, ‘I got accepted into this drama school, my mum told me this, my dad told me this’. He came to see this production and he was so shocked like wow! You are so talented and we never knew that before. I mean you have fantastic testimonies from this people. You know, there are some of them that used to be in gangs and now they are singing and acting, and have realised they don’t want to go down that route. So, yeah, it makes you realise, ‘this is why we are doing this and even though it is amateur, out of the 50 people we work with, a couple of people have come up to me to say I got this and got that. Belinda: Why are you doing Life On The Stairs a second time? Gbemi: One was because the last time, I was quite overwhelmed at the response and how well it did. Young people coming to see the show three or four time and saying we have been so many times, my mum won’t pay for me to come again. We got a lot of people saying, I really relate to this character and people saying can we do it at my school? We did it for five nights and the consensus for a lot of people was that we heard about it but couldn’t get tickets or by the time we heard about it, it was too late. We want to see it again and be involved in it this time, because of all the responses; I thought we need to do this again. I was developing last year and because of time and financial constraints, there were so many things that I wanted to achieve but we couldn’t because a few things in terms of the artistic value and just the ideas that I had that thought we couldn’t do. The practicality of it at the time, money and all that and I thought this year we are going to do it. And also, I am quite new to the writing game and I am developing the script and it is still something that is still in me and the play, it feels unfinished. So, I want to do this a second time. One, maybe I don’t know but to develop it further with a new cast. Two, give others new opportunities with what the old cast did and also to have better production values than last year and take it to a completely different city and close the book on it. Belinda: Where did you get the inspiration to write Life On The Stairs? Gbemi: I started writing it when I was in Germany while appearing in Rent. It was the idea of being in Rent and seeing all these characters dealing with relationships, love lust and all the drama that comes with it. The main inspiration was from living in a council estate all my life and there are a bunch of kids always sitting on the stairs over the days and weekend doing all sorts, drink, drink alcohol and smoking, and really getting up to all sorts. These kids don’t realise that the stairs is meant to either take them up or down, left or right. It was about conceptualising that these stairs represent what people can do with their life. Belinda: Why did you decide to bring dance into the production and fuse dance and drama together? Gbemi: It was about bringing the East-end to the stage and I think dance is drama, it is telling your audience the story through dance. Belinda: What are some of the challenges you have encountered to date? Gbemi: The biggest is that starting off is not easy and the fact that no one believes you can do it and they ask, sorry who are you? Money as well, money will always be an issue. For me personally, coming from an acting background and working with people who don’t understand the discipline of it. When you are rooted in the discipline of it and see kids coming in and strolling in late. Dealing with that and having to develop the patience and understanding with them. Belinda: And what are some of the highs and lows? Gbemi: The highs, was when the audience stood up in the last production and burst into a round of applause and clapped. The lows was been let down by venues and money, and also because I put a lot of my acting on hold and say I am not going to work and concentrate on this. I missed my acting a little bit. Belinda: The money aspect. How did you deal with it? Gbemi: A lot of it was down to divine intervention and people donating and getting grants for it. I remember on the first night, the venue’s boss was like they haven’t paid us yet. Belinda: Your name is Faith Drama, does that put people off? Gbemi: In order to appeal to wider audience, we have moved out of the church setting and made it more accessible to everyone though we started in church. Faith can mean so many things, it can mean anything. So, I don’t think it has hindered us at all. Belinda: What inspired you to develop your directorial and creative side? Gbemi: I have always loved to write but I have prioritised the acting. To be with certain production companies and trust the director is like wow! I want to see if I can do this. I have always been fascinated by theatre and not just acting. Belinda: After this production what should we look forward to from you? Gbemi: For me, I hope to get more into the television and film industry but it’s really about giving more people the opportunity to write and have their work produced. This entry was posted on Friday, August 20th, 2010 at 4:25 am	and is filed under Interviews, Journalism, People, Theatre Interviews. You can follow any responses to this entry through the RSS 2.0 feed. You can leave a response, or trackback from your own site.